Happy Thursday to everyone out there! 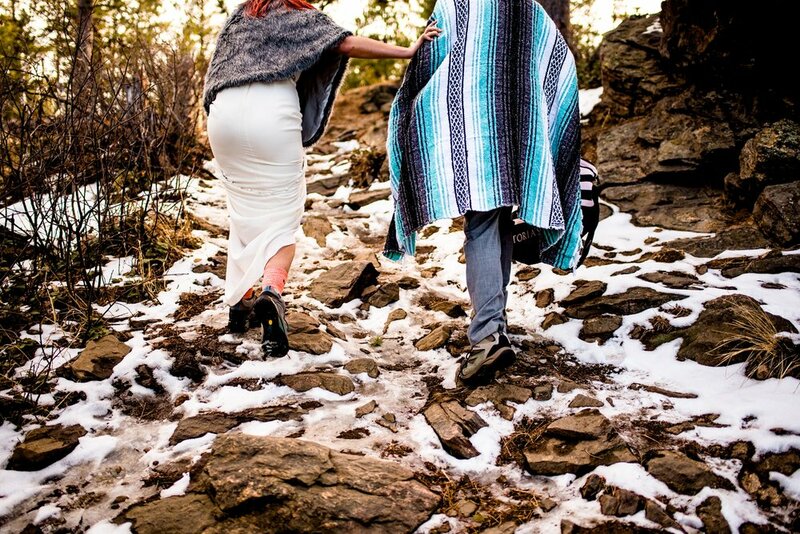 I am very happy and excited to share Alicia & John’s Golden Colorado elopement photos. I have sooo many favorites from this day! While we took photos in lovely locations and quite frankly some of my favorite backdrops in all the land, that only plays a small role in why I love these pictures so much! It boils down to what it always does for me – the people. Specifically, the attitude and energy that people bring to the session and how they embrace the experience. I think it is completely normal for all of us to tense up a bit in front of the camera. Being told to act natural in a somewhat unnatural scenario goes exactly how one might expect in many situations. I sure do my darndest to make the people I work with comfortable being photographed but the real magic comes when all of us are on the same page and it is a true collaboration. If you open yourself up fully or are willing to open yourself and share in the experience, those are without a doubt my favorite of photos. Obviously, this statement can be interpreted in different ways but the message I am trying to put forth isn’t one of tuning into your photographer to an extreme amount but pushing yourself to be present in the moment with loved ones and enjoying that time. It may be a cliché but this all falls in line with a principle that has never failed me in life. You get out what you put in. The topic of this post was 150% influenced by Alicia and John and the beautiful attitude and energy they brought to this day. Their willingness to try anything and cherish the time spent with each other is exactly what inspires me as a creative and makes me love doing this job.